The widening gap between rich and poor that has disfigured and weakened our society over recent decades is widely deplored, but there is surprisingly little understanding of how that growing inequality has been brought about. For most people, it simply reflects the natural order; the rich have each individually taken their chance, as anyone would, to inflate the rewards of various kinds – profits, salaries, bonuses, share issues, golden handshakes – that they are able to command. Their riches are regarded, as a general proposition, as a reward for their success. But those huge advantages – on a scale so outrageous that it is hard to comprehend – have not so much come about by good fortune or because the rich have individually discovered the path to great wealth through their own hard work, cleverness or luck, but because the whole operation of the modern economy has been deliberately geared to favour them as a class. 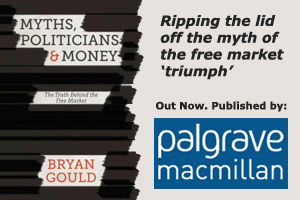 The statistics are incontrovertible; the rich have claimed virtually the whole of the additional wealth that has been produced over the past thirty years. They have been able to do so because they were already rich. It is beyond doubt that the best way to become seriously wealthy is to start off wealthy in the first place. The rich have, in other words, been the beneficiaries of a complex and comprehensive interlocking set of policies that have been deliberately put in place to ensure that their wealth just keeps on growing. Those policies have formed the bedrock of the neo-liberal consensus adhered to by governments in most western countries over the last three decades. That consensus has been peddled as benefiting us all, but it has been in reality a huge machine designed to increase the advantages that the rich enjoy over the rest of us. The merits of globalisation, the virtues of monetarism, the over-riding importance of restraining inflation while taking a relaxed attitude to unemployment, the primacy of banks in making decisions about our economy, the superiority – indeed, infallibility – of the market as opposed to the supposedly stultifying effect of government intervention, austerity as the correct response to recession, have all been articles of faith for governments of various political colours; indeed, in the British case, New Labour was among the most enthusiastic proponents of all of these nostrums. How have these policies – supported on the face of it because they are supposed to produce a more efficient and productive economy – actually contributed to widening inequality? Let us take, for example, the widely accepted view that the only goal of macro-economic policy should be the control of inflation, and that that is best done by restraining the growth in the money supply – a task that should be entrusted to unelected and unaccountable bankers and is therefore immune from scrutiny by democratic agencies. But monetarism takes an essentially static view of the economy’s capacity to grow and create new jobs. The priority given to inflation ensures that as soon as there is any sign of growth, the brakes – in the form of higher interest rates – are slammed on, with the intention that that the value of existing assets should be protected; but, at the same time, a high unemployment rate is also guaranteed and becomes endemic. Continuing high unemployment, of course, suits the interests of employers, by holding down any threatened growth in real wages – and unemployment remains the single most important factor in creating avoidable poverty. Monetarism, in other words, is a mechanism for protecting the interests of the rich but sacrificing those of the majority. The same inbuilt bias in favour of the rich can be seen in many other aspects of policy. The propensity to raise interest rates as the principal instrument of what remains of macro-economic policy has the effect of favouring the holders of assets – those who are already wealthy and who operate in the financial economy, at the expense of those wishing to borrow for productive investment – those who live and work in the real economy and are the creators of new wealth. And the primacy accorded to the banks in deciding economic policy places the alcoholic in charge of the brewery. The astonishing monopoly allowed to the commercial banks – the power to create money out of nothing by the stroke of a computer key and then to use the proceeds for the purposes that they alone decide – delivers to them immensely more power than that of elected government. They have not been slow to use that power to shift the balance of advantage further in favour of the “haves”. Their enthusiasm, for example, to lend for non-productive purposes, such as housing, inflates the value of housing, (and, incidentally, diverts investment from the productive sector), so that there is a massive transfer of wealth to home-owners at the expense of those who can’t afford to buy their own homes. Globalisation has also played its part. Our ability to defend and promote our own interests – to decide the direction of our own economy -has been steadily eroded by the increasing dominance of the global economy by an ever more concentrated group of super-rich. The freedom of international investors to move capital at will around the globe, and the vast sums at their disposal, have meant that democratic governments have found themselves compelled to comply – for fear of losing investment if they do not – with the wishes of those investors, rather than securing social, environmental or political outcomes that are more congenial to their electorates. And it is of course a curious aspect of the global economy that it apparently requires top executives to be paid at the highest international level – a level that is constantly being bid up – to ensure, we are told, that we attract the best talent; but, at the same time, it demands that wages – treated as just another production cost – must be held down to match the lowest levels in competing low-wage economies. And on the subject of our international competitiveness or lack of it, the deep-seated and long-term opposition to ensuring that our exchange rate is at a competitive level and the refusal even to consider the issue (dating back at least to Harold Wilson’s futile battle against devaluation and Denis Healey’s rejection of the IMF’s advice to frame monetary policy in terms of Domestic Credit Expansion), are a further reflection of the power of the wealthy to set the agenda. A lower exchange rate would of course stimulate the economy and create more jobs, and is by far the fairest and most immediately effective and comprehensive means of improving competitiveness in a global economy in which others are becoming constantly more efficient; but it would also reduce the international value of assets held by the wealthy, who have managed to dominate such limited debate as there has been by constantly asserting, in defiance of the evidence, that a lower exchange rate would erode any initial gain in competitiveness by increasing inflation. As a result, we have placed the whole burden of maintaining or improving competitiveness on wage-earners; we are constantly told that we can’t afford higher wages, and that improvements in competitiveness must come from cutting costs – and essentially labour costs. The preferred instruments have accordingly been measures to reduce the bargaining power of workers, weaken trade unions, make it easier for employers to pay low wages, and make life tougher for the unemployed and other beneficiaries so as to force them back into the labour market to compete for low-paid jobs. Our unacknowledged problems with competitiveness have meant the sacrifice of manufacturing, where working people are best able to earn a living and whose decline has reduced any prospect of new jobs, innovation and productivity improvements, in favour of a financial services sector which delivers its benefits uniquely to those who have access to capital. The otherwise incomprehensible insistence that austerity is the correct response to recession is to be explained in the same way. Recession has always been seen as an opportunity to weaken labour, ever since Andrew Mellon, the multimillionaire US treasury secretary, issued the rallying call to employers after the 1929 crash, to “liquidate labour”. The high rates of unemployment engendered by recession have always meant a reduction in the bargaining power of workers – an opportunity to swing the balance of advantage further in favour of employers that has been too good to miss. Recession has also meant that government spending has become an easy, if irrational, target. The constant impetus to privatisation, already powerful as an element in neo-liberal doctrine, has received a further fillip from the supposed need to “cut the deficit” by slashing government spending. So, the support provided by public services is weakened when the disadvantaged most need it, and the opportunities for profit-making and profit-taking by private commerce are enlarged. Again, the rich emerge from adversity with their advantage over the rest of us enhanced. Underpinning all of these developments is the article of faith that the “free” or unregulated market can be accurately predicted on the basis of mathematical models and that it is self-correcting and infallible. The acceptance of this doctrine has been a sure-fire recipe for allowing the rich to entrench and intensify their existing advantage. If intervention in the market is to be eschewed, and market outcomes are not to be challenged, the way is clear for those who are already dominant to use their power to grab what they can, all the while proclaiming that no one should complain because that is what the market ordains. None of this should be a cause for surprise. These elements have been present, if not overt, in the policies pursued for over three decades by successive governments. While attention has focused on the huge incomes and low tax rates organised for themselves by the rich, it may not have been fully recognised how far their gains are the result of policies that have been part of a coordinated and self-reinforcing pattern, that has had as its deliberate aim the reinforcement of the power of the wealthy to dominate our economy and the weakening of the power of workers to protect themselves. The destructive gap between rich and poor has widened, in other words, because the rich have been able to bend governments to their will and have used their power to ensure that it is so.